This festival started as a wedding party has turned into the Fern Hollow Farm Festival. Come out and enjoy a weekend of regional and national music from bluegrass to rock. The Fern Hollow Farm is a beautiful place to be in June. BLUEGRASS SUNDAYS AT ASPEN MOUNTAIN. A favorite among locals, Sundays feature top bluegrass musicians from around the world, performing in this ideal Rocky Mountain setting. The free open-air concerts are held from noon to 3 pm on Sundays just outside the Sundeck (on top of Aspen Mountain). The Ohiolina Festival is an amazing mix of food and music , celebrating the diverse cultures and the links between Ohio and the Carolina’s, family friendly and great music along with top notch food trucks. A portion of the proceeds from each ticket benefit The Ohiolina Music Scholarship Fund, an arts and music education fund with the Community Foundation of Mount Vernon and Knox County. Woody Pines makes his solo debut in Rochester NY at the Abeline Lounge. Come out for a night of Ragtime blues and swing guitar, voice, harmonica and stomping. Come out and swing in 2019 with a night of electrified string-band music and hot jazz along featuring Woody Pines alongside the High Water Drifters! Check out this Video by Woody Pines…..
Its been a hot minute since Woody and his band have been on the Casa stage. Come out and enjoy a night of electrified string-band music and hot jazz along with the very real possibility of local legend Ted Harris making an appearance. Come out and enjoy a night of electrified string-band music and hot jazz with Sean Geil and Woody Pines! Sean Geil is a founding member of Cincinnati's The Tillers, and has spent the last eleven years traveling the country writing songs and performing everywhere from living rooms to major music festivals. Sharing stages with legends like Doc Watson, Ramblin’ Jack Elliott, Guy Clark and Del McCoury . Along the way, he's recorded six albums with the band, toured every region of the U.S., and played in the U.K. and Canada. But Geil is more than just a part of a whole, with a rare talent for storytelling that demonstrates a keen intellect, sensitive perspective, and altruistic instinct uncommon in today's musical landscape. His songs eek out a place of their own, uniquely poised on the contrasting verge of frustration and sorrow, wistful memory and gritty fight song. It's evident on records, but especially in-person, the living, breathing soul of his work, delivered as a conversation with his audience, a plea to his country, and a thank you to his friends and family. To any fan of folk and old-time, it's immediately apparent that Geil has done his homework: he delivers with casual virtuosity reminiscent of the greats of his genre. When not with The Tillers, he performs solo, playing traditional folk songs on banjo and guitar, versions of his band's work, and originals from his fifteen years of writing and performing. His newest solo album is set to release in early 2019. 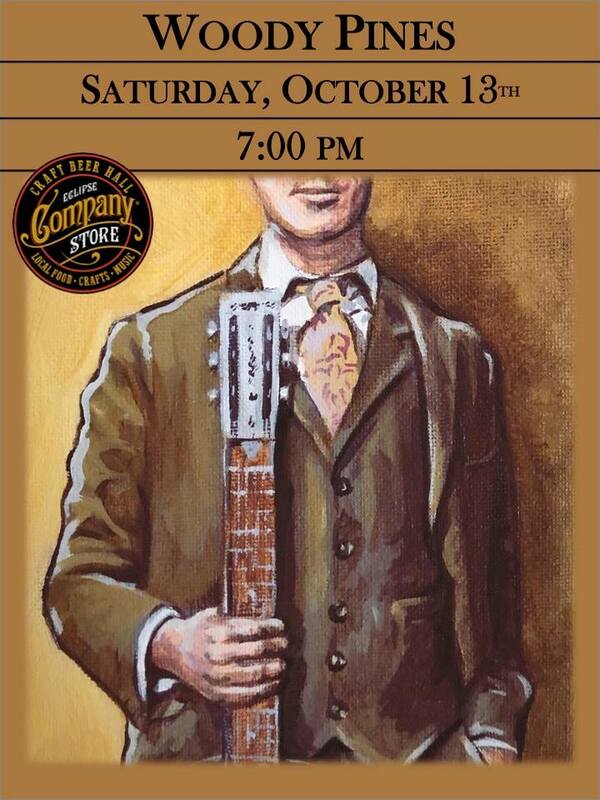 There may be no more appropriate venue for the throwback swing rhythms of Woody Pines than the old Eclipse Company Store, and there's nothing better than hearing Woody play in the great outdoors! So come on out to take in a great outdoor show by one of Athens' favorite national music acts! If you've ever seen Woody and his crew play ... you know you're in for a treat! Woody Pines is playing at the Purple Fiddle in beautiful Thomas, WV. Come and check out this music venue offering daily live entertainment, plus an on-site hostel. Our annual concert in association with The Hazy Recollections gang always proves to be a popular one. Line up this year includes our out of town visitor in Woody Pines, plus some of the best Scottish Acts on the scene, including Yvonne Lyon, Al Shields, Adriana Spina, and Noah and The West River Band. We have moved this show to a slightly bigger venue here to keep up with demand. Join Starry Skies and Woody Pines for a Party on Saturday at Oran Mor'. Woody Pines from Nashville at 7.45 // Starry Skies at 8.45. 'Be Kind' Albums plus two limited edition designs of Starry Skies t-shirts available along with lots of other good stuff. Last minute show added TONIGH! I am honored to be supporting Nathen Bell in Kilbarchan, Scotland. Looking forward to playing "Satisfied" at this couples wedding for the first dance. What a huge honor! I will be in Scotland for the week playing a few shows and ding a few workshops around the U.K. as well as taking some time off in the highlands to work on my book. Riverdog is a unique property five miles west of Oberlin, Ohio on the East Fork of the Vermilion River. Deborah Banyas & T. P. Speer began a music series in a renovated 150 year old barn that is dedicated to showcasing high quality music for lovers of serious "roots" music in it's many forms: blues, jazz, acoustic folk, progressive bluegrass, swamp rock, alt country, swing, singer/songwriter and all the rest of the genre that is elusively refered to as "Americana". Concerts are informal, intimate and comfortable for guests. No one has to squeeze into an auditorium seat, no one has to stand and no one has to spend a fortune for a beverage! Warm weather shows take place in the historic country barn which possesses stellar acoustics and has a capacity of approximately 225. Picnics, dancing and BYOB are highly encouraged, but music is the main focus. Most visitors have a table for their food and beverages. Whenever possible, food trucks are lined up to be present for shows. Columbus Ohio, We are looking forward to playing in Worthington! The entertainment is presented on a specially designed stage with high-quality sound, lights, and video, with care being taken to provide all patrons with a great view of the shows. The music presented showcases the finest national and regional acts in a wide variety of styles, including Americana, Jazz, Blues, Folk, Rock, and Classical. The 20th Annual Ohio Pawpaw Festival will be September 14-16, 2018. We hope you can join the crowds of happy folks at scenic Lake Snowden in Albany, Ohio, for 3 days of pawpaw music, food, contests, art, history, education, sustainable living workshops, activities for the kids and lots more! The Pawpaw Shuttle will once again be available to shuttle folks to and from the fest! We will post the schedule when it is available. Click here for more info. NO DOGS allowed on festival grounds. No weapons, outside alcohol, or illegal substances permitted. Ohio Pawpaw Festival is located at 5900 US 50 West, Albany, OH. Yes, We do private parties, weddings, birthdays, graduation's, holiday parties and more. The Kenlake Hot August Blues Festival is a Kentucky and Mid-South tradition. It began in 1990 at Kenlake State Park and has always been held the weekend before Labor Day weekend. Come cool off on Kenlake this Laborday Weekend. Columbus Ohio. I have heard so many great things about Rambling House. Glad to be added last minute to a WEDNESDAY night of music and rowdy hoe-down fun. Benefit for Missouri River Communities Network (more info here: http://www.moriver.org). Roots music is live most nights in this brick-walled bar with a big whiskey menu & delivered food. 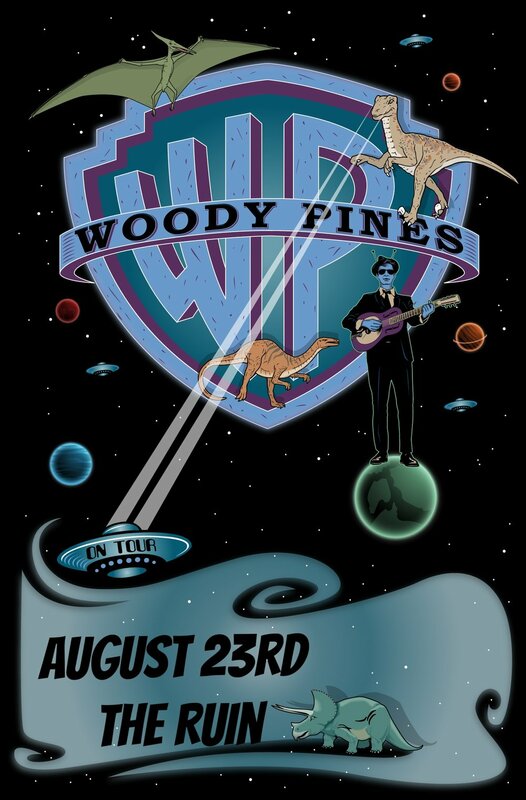 The Woods is thrilled to announce that Woody Pines will be here on Friday, August 17! Doors and Arcadia Valley Roasting Company open at 6! Show at 7! Tickets $7 at the door! Canoegrass is a bluegrass festival and campout. The banks of our private lake will come alive with the best entertainers in the region. Come One, Come All. This is a FREE SHOW in Centennial Park in the heart of Lancaster New Hampshire. Come out and enjoy the show with friends and family. All ages welcome. Sunday at Jackie o's Brewpub!